Considered a major pest to corn and other crops, the various stages of the European Corn Borer are destructive, yet well designed. 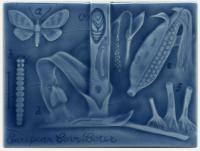 The image on this tile is based on an old engraving found in a book of common garden pests. I became familiar with a number of them that year - watch for more tiles to be carved in their honor, in hopes of keeping the little demons at bay. 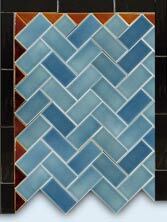 This tile measures approximately 5 5/8" long x 4 1/4" high, and is glazed in our gloss crackle Azure (WA-20).